Those are just a few of the words The Legal Genealogist might use to describe the members of the Jewish Genealogical Society of Greater Boston. They were kind enough to invite me to be the kick-off speaker for their 2013-2014 program season yesterday and all I can say is… I hope it’s not the only time I’m invited. There’s nothing a speaker enjoys more than people who listen… and then ask good — and challenging — questions afterwards. And the JGSGB members did that, and more. They shared their stories before and after, they were warmly welcoming1… and they proved — in spades — that local genealogical societies can be successful and thrive. According to its website, the JGSGB was first organized in 1982, making this its 31st year. It began as a study group to looking into Jewish family history and has grown into an active society with more than 400 members. The society’s accomplishments over those 31 years are too many to list in full. It has been the local host, twice (including this year), for the conferences of the International Association of Jewish Genealogical Societies. It has created and offers each winter a 17-hour genealogy class taught at Hebrew College in Newton Centre, Massachusetts. Its members have compiled indexes to the obituaries and wedding announcements in The Jewish Advocate, Boston’s major weekly Jewish newspaper. It maintains a non-circulating collection of Jewish genealogical materials that it makes available at membership meetings and it maintains a non-circulating research collection in the Wyner Center of the American Jewish Historical Society, New England Archives, located on the fifth floor of the New England Historic Genealogical Society Library. In other words — to put it mildly — the organization is among Beantown’s best when it comes to actively serving the genealogical community. • Its award-winning journal, Mass-Pocha, with informative articles and news of Jewish genealogical events. • One-on-one research & translation assistance. • Access to the JGSGB’s extensive collection of research books and materials. • Guidance from local experts to help you with your research. • Free admission to interesting and informative monthly meetings. And in addition to the one-on-one sessions, which often focus on records from countries of origin, something new for 2013-2014 will be help sessions before each meeting for folks needing assistance with U.S. records. 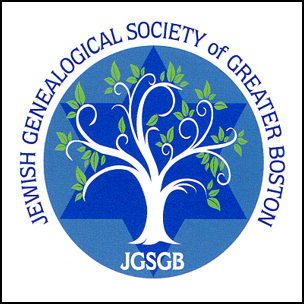 The Jewish Genealogical Society of Greater Boston is proof positive that genealogy is alive and well — and growing. In a time when societies are struggling, it’s nice to hear of one who is still thriving. On behalf of the JGSGB I want to thank you, Judy, for a terrific presentation — many folks have said how much they appreciated, and learned from, your talk on breaking through immigrant brickwalls. We are also delighted with this shout-out to our society and thank you for the kind words — and the great PR! I would like to note that we currently have about 550 members (the 400 member number was from our old brochure, that has been replaced on our web site with the new, updated brochure). Thanks again, Judy, for getting our new program year off to such a successful start. Glad to see the numbers are even higher than before, Meredith!